The first column on the left is RPM. The second column is Torque. The third column is Horsepower. The fourth column measures the pounds of fuel used per hour to make the horsepower at that indicated rpm. A quadrajet would have only one bowl. The front bowl on a Demon type carb is named "A." The rear bowl is always named "B." On this partucular column both A and B are added together. The fifth column is oil pressure. The sixth column would have been the reading from the Air Hat. Which is a turbine that measures the volume of air the engine used during a dyno pull. We don't always use the turbine as it is an expensive device, and a nitrous backfire could destroy it. 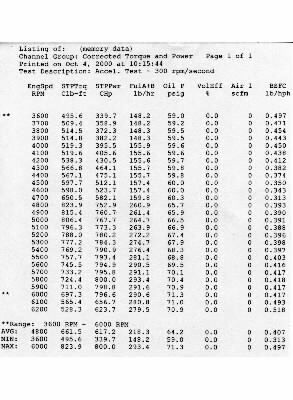 The reading from the turbine does not effect the power readings. It's merely a calculated measure of air used to calculate the volumetric efficiency, or VE. But VE readings should be taken with a grain of salt. It can be affected by cam designs which if not properly understood could misguide a tuner. The last column is BSFC. Brake Specific Fuel Consumption. This number is the measurement of how much fuel in pounds, used in an hour, to make the power recorded at that rpm. The BSFC number can be used as a tuning tool, but only by an experienced tuner. It's also often misinterpreted by lesser experienced people when comparing two different engines.